Hilary: On this bitter winter day, I figured why not start thinking about my garden plans for the coming year? It may seem silly, but we recently lost a dog who was a Chinese Shar-Pei. We thought about planting a new bed near the porch where she loved to lay and watch the neighborhood and bask in the sun (or shade, depending on the time of day). I was thinking of some Oriental Poppies and Chinese Forget-Me-Nots mixed together. I was hoping to get your opinion on if you think these two varieties would work together and any particular requirements they might need. It seems they’re both pretty easy plants to deal with, but always appreciate your insight. Doug: It’s not silly at all. The poppies and Forget-Me-Nots would work. I’m thinking you want to go with an Asian theme, which makes sense. The upside to the poppies is that once in place they will return year after year. The downside is that they aren’t in bloom for a long time, maybe a month if you’re lucky. 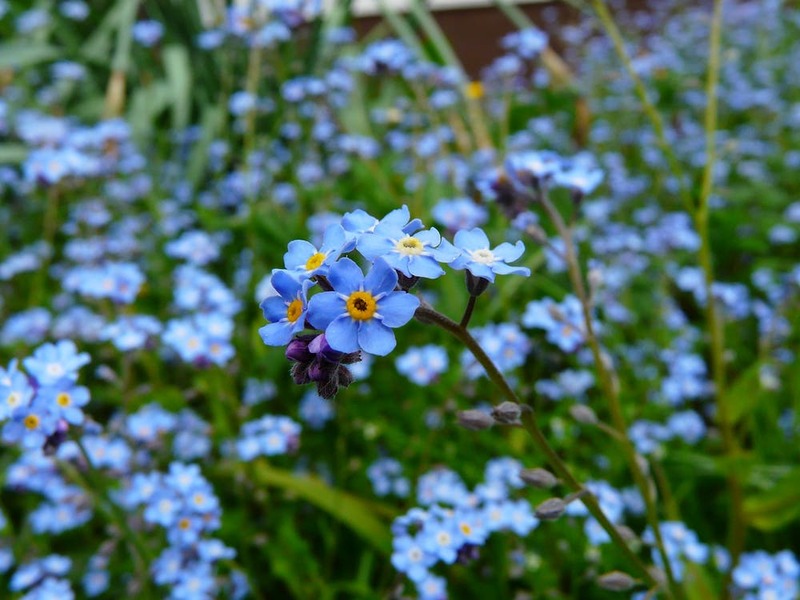 The Forget-Me-Nots are annual and will be around from frost to frost, blooming all season, but will need to be replanted each season. When they are in bloom together, it will be spectacular. Sometimes Forget-Me-Nots will self sow and could come back on their own. Full sun is essential for the poppies, but the Forget-Me-Nots could take a little shade. Here are some other ideas just to kick around for your theme: Japanese maple, flowering cherry, gingko, azalea and hostas. Rebecca: I’ve had three orchids for three years and no blooms since I brought them home from the store which they did have flowers on them but afterwards nothing. What am I doing wrong? Doug: In about a month when the days get longer, start fertilizing the plant. Use an organic, liquid fertilizer like Grow from Espoma Organic. Dilute it to half strength and feed the plant every other week. The other thing that can help them bloom is a change in temperature. Let it grow outside for the summer and when things cool off, bring it back in, that can also trigger flowering. Dennis: Where can I purchase Iron Lady Tomato seeds? I am interested in Iron Lady tomatoes because of their early blight resistant. Blight is a big problem in my garden in Indiana County. Doug: This is a really good seed catalog. Look through it and order some cool other stuff, too. Take a look at ‘Defiant,’ ‘Jasper, ‘Matt’s Wild Cherry,’ ‘Mountain Magic’ and ‘Mountain Merit.’ The only one I’ve grown is ‘Matt’s Wild Cherry,’ and it’s one of my favorites, but I’m partial, my youngest son shares the name of the tomato.